MELBOURNE, Australia (AP) — World Cup or Ryder Cup: Put Ian Poulter into a team event and he never seems to disappoint. Poulter’s approach to less than a foot helped set up one of England’s six birdies on the back nine Thursday to give him and Tyrrell Hatton a share of the lead with South Korea and Australia after the first round of fourballs at the World Cup of Golf. Cameron Smith made a 10-foot birdie putt on the 18th to ensure he and Australia teammate Marc Leishman were in a tie atop the leaderboard with South Korea’s Byeong Hun An and Si Woo Kim, all with 10-under 62s at Metropolitan. On Friday, the format switches to foursomes, or alternate shot, and again for the final round. Poulter has picked up 15 career points in Ryder Cup events for Europe over the United States. He had two in Europe’s win in Paris in late September — one with Rory McIlroy in foursomes (he also lost with McIlory in foursomes) and a singles victory over Dustin Johnson. He was happy with the way he and Hatton combined for the fourballs on Thursday. “If you get off to an average start in foursomes, things can start going the wrong way pretty quickly,” Leishman said. An said he and Kim combined well to keep South Korea atop the leaderboard. Three teams were tied for fourth, one stroke behind — Belgium (Thomas Pieters and Thomas Detry), Malaysia (Gavin Green and Ben Leong) and Soren Kjeldsen and Thorbjorn Olesen, who won the title for Denmark by four strokes two years ago at nearby Kingston Heath. India (Anirban Lahiri and Gaganjeet Bhullar) and Ireland (Shane Lowry and Paul Dunne) were tied for seventh after 64s. 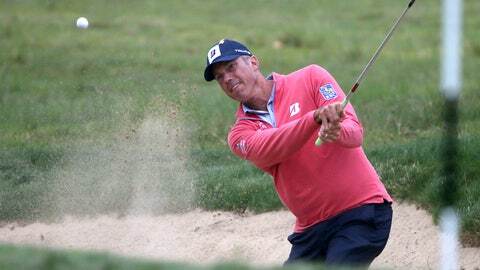 The U.S. team of Kyle Stanley and Matt Kuchar was in a large group tied for 13th among 28 teams after a 66. Officials moved up tee times for Thursday because of expected storms and showers which didn’t eventuate. When the last group finished, the sun was shining and the wind had dropped off. Rain is in the forecast for both Friday and Saturday, with a high temperature expected of only 14 Celsius (57 Fahrenheit) on Friday.